Believe it or not I have a teenager in the house. A teenager who thinks he wants to shave now and then. As sad as this is it means that the classic gift of a new razor totally works this Christmas! We are giving the boys gifts themed around travel this year since our goal is to go on more adventures this year than ever before. I love adding a little bit of personalization to store bought gifts, especially for men (or teens) who might not appreciate all homemade gifts. For the store bought gift both my teen and my husband could use a razor. I saw this Philips Norelco 4200 razor at Target and of course had to pick up the one exclusive to Target (I love how their shaving aisles have changed over the years). This one is designed for wet or dry use, and provides a comfortable shave while protecting your skin. The cordless shaver features blades that lift hairs to cut comfortably below skin level – perfect for my husband or my teen! 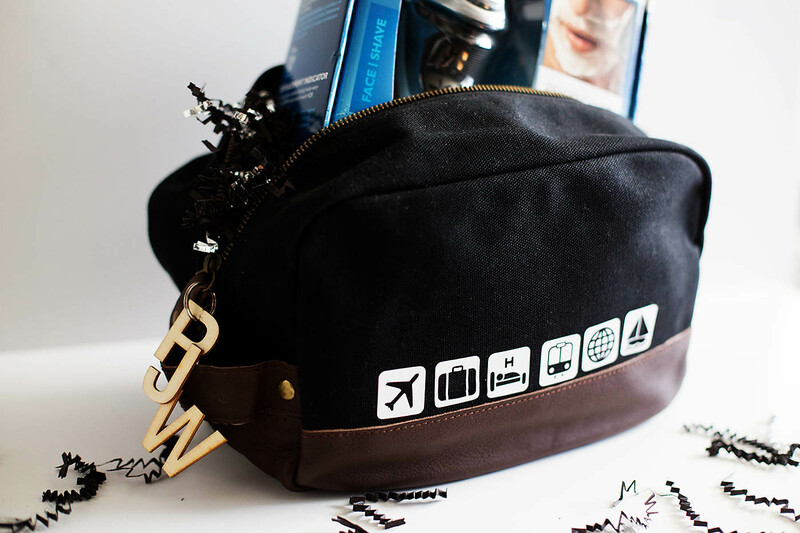 Since I’m theming my gifts to travel I thought a toiletry bag would be perfect to add to this teen gift. My son doesn’t have one yet and usually just ends up putting his toiletries into a zip top plastic bag of some sort. I found this nice canvas and leather one at Target and it has the perfect amount of room for his Sonicare toothbrush, toothpaste, deodorant, spray, shower supplies AND this new razor (not that he’d need to use it on short trips haha)! To personalize it I thought I’d add some travel icons to it with Silhouette heat transfer vinyl. I like to keep the permanent personalizations without names in case any one of the guys in the house need to use something, but I’ll show you later how I added his initials to the bag to make it his for now. I found some fun travel icons in the Silhouette design store and added them to my library. I measured the toiletry bag to see how big I wanted to make the icons. I didn’t want them to be huge. I placed the icons I wanted to use in my Silhouette canvas and reversed the images so that when ironed on they’d bet the right way. Then I cut them out. Tip – make sure your blade is nice and sharp. The heat transfer vinyl is simple to use. Just cut out the designs and remove the extra vinyl you don’t want on your final product. Then, iron them on using the instructions on the box. You could also use printable iron on paper for dark fabrics if you don’t have a cutting machine, or fabric paint! I had to iron a couple of extra times because of the thicker, textured fabric but it worked well! They are modern, masculine and go right along with our travel theme! I glued his initials together using some super glue. Then I added a keychain and put it on the zipper pull! I think it really finished off the personalization without going over the top. Now you could give the gift in a basket or package it all up together. Since I know he needs one, I’m going to package it all up together and out of the box. Super easy and fun! I may need to make two more toiletry bags though because I have a feeling my husband and younger son are going to want one now too (not to mention another razor). This Philips Norelco 4200 is a great choice because it can catch both long and short hairs, has a pop up trimmer so you don’t need to bring an extra along, and it has 50 minutes of cordless power so you don’t even need to bring the plug with you on most trips. Do you have someone in your life that would love this gift idea? Here is even more awesome inspiration from other bloggers on how to give the gift of Philips this year!